A Middle-East operator with large number of onshore wells were looking to save man-hours and minimize well risk. A Middle-East operator had large number of onshore wells in both rural and urban areas. Most well work was done on campaign basis, and when well issues occurred. The operator saw that a lot of time was spent driving between wells, and that wells with the worst consequence level (i.e. proximity to people) was not always prioritized. So they came to the idea that the planning of well activities could be made more efficient if they combined the well integrity management of their wells with the well slot locations. The map in WellMaster IMS has proven to save man-hours and improved how we prioritize well activities. The operator use WellMaster IMS to manage well integrity, and a GIS system to get a geographical overview of the wells. To combine the two, ExproSoft implemented Google Maps in WellMaster IMS, and integrated with the GIS system for well coordinates. 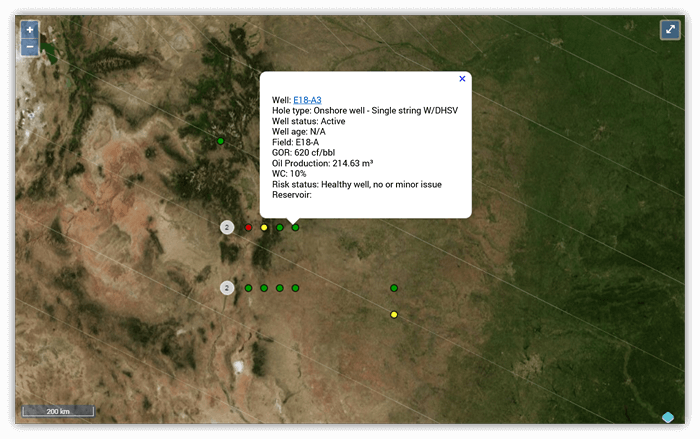 Now all wells are displayed in a map view, along with the color-coding showing the wells’ integrity status. Clicking on a well also bring up key data for quick assessments, in office and in the field. Interested in learning more about WellMaster IMS? Contact us or Request a demonstration now!